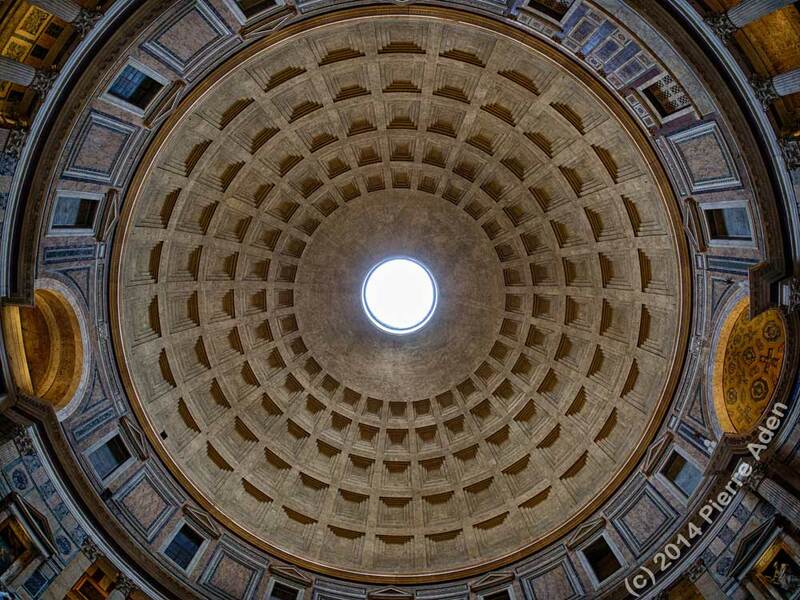 German-based photographer, Pierre Aden, captured this perfect image of the Pantheon’s extraordinary dome from the inside. It beautifully illustrates the 28 symmetrical 3-dimensional ceiling sections. I’m feeling inspired to create a mandala. And here we look at the dome from the outside. While it’s impressive from a structural point of view, esthetically, like a box of kid’s cereal, the prize is on the inside. The Pantheon is a temple whose outside would not quite suggest the impressive and awe-inspiring interior. Completed in 126 AD by the Roman Empire, the temple was built for worship and remains one the best preserved pieces of ancient Roman architecture. 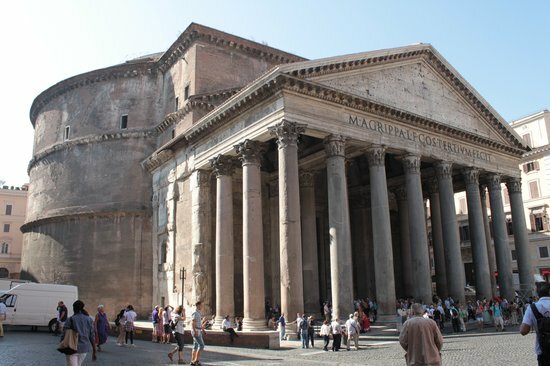 Its name, “Pantheon”, is derived from Greek and means “All the Gods” as it was designed as a temple for all the Gods of ancient mythology, whose statues would have placed inside. The structure’s initial construction date is debated; much of the building is believed to have been destroyed and rebuilt, and repaired several times. On the façade, it reads an abbreviated form of “Marcus Agrippa, son of Lucius, made this building when consul for the third time”, which suggests the date was as early as 31 BC. Research suggests that the façade was the only part to survive destruction after several fires, and the rest of construction was started in 114 under Trajan. 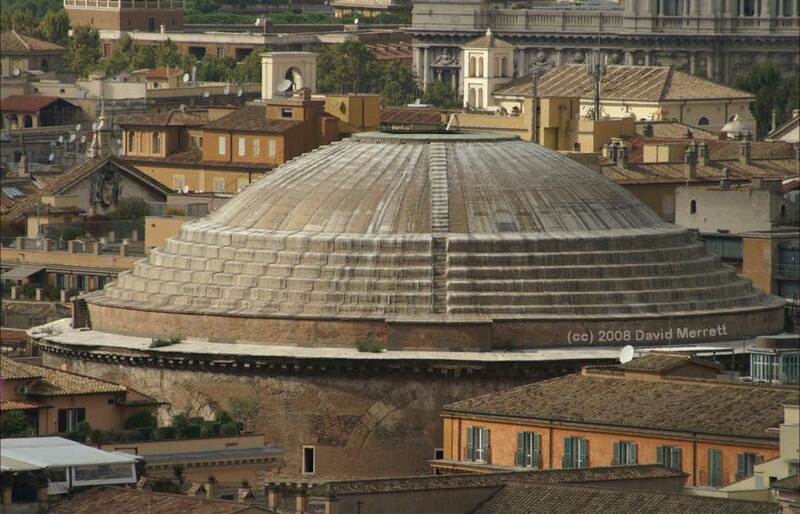 The then modern and innovative use of concrete allowed the dome to become the largest unreinforced dome in the world. In 609, the Pantheon was given to Pope Boniface IV by the Bryzantine Emperor, Phocas. Pope Boniface consecrated the building as “Santa Maria dei Martiri”, converting it to a Christian church, as it remains today. Check out their full list of 52 Ancient Roman Monuments from around the world. Today’s mandala reminds us that facades may be just that, a facade. See and appreciate the beauty on the inside.